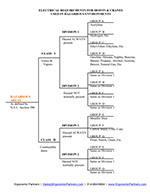 Coffing chain hoists are used in all sectors of industry. 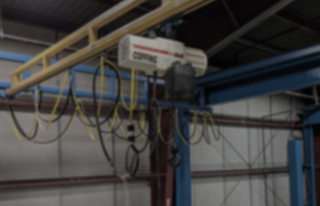 These hoists are built for heavy industrial usage and are built tough in the U.S.A. Coffing has been a trusted manufacturer for over 50 years. 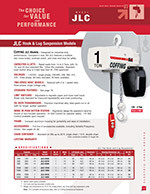 Coffing Hoist Capacities and Lifts - Rated loads from 1/8 to 2 Ton Metric Rated. 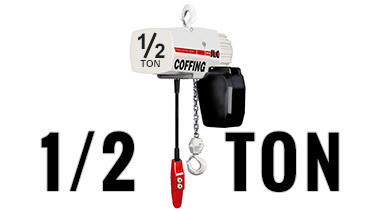 Rated loads from 1/8 to 2 Ton Metric Rated. Standard lifts of 10, 15, and 20 feet. Other lifts available. CSA approved. Voltages - 115/230 - single phase; 230/460, 208, 380, 415, 575 - three phase 60 Hertz standard, 50 Hertz available. 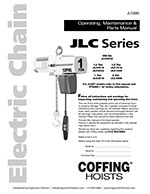 Electrical Controls - IEC style controls meet or exceed electrical codes. Chain Container Standard - Molded quick connect chain container prevents slack chain from interfering with operator. 20 ft. lift single reeved, 10 ft. lift double reeved. H4 Duty Rating - Handles heavy duty work environments for your toughest hoisting applications. Upper Composite Chain Guide -Improves chain life. Top Suspension - Quick-change from hook mount to lug mount. 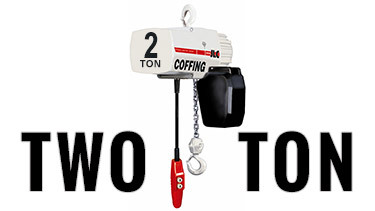 One Chain Size - All Coffing hoist models have the same chain to reduce inventory. Manual and Motorized Trolleys -Cross-mounted to improve end approach. Increased Flange Range - Up to 7 inches on motorized trolleys. The wheel s can run on either I-Beam or wide flange. Improved Headroom - For plain and motorized trolleys and 2 Ton models. Weather Resistant - Coffing Hoist is NEMA 3R enclosure. Lifetime Warranty - The Industry's Best (see below). Mechanical Overload Protection Device - Helps protect Coffing hoist, operator, and supporting structures from damaging overloads, chain jamming and reverse phasing. Limit Switches - Adjustable to regulate upper and lower load travel. Brass nuts standard for improved repeatability and chain positioning. Multiple Disc Motor Brake - Heavy duty design for reliable operation. Direct acting for positive load holding and spotting. Chain End Stop Assembly - Fits below dead-end link on lifting chain for added measure of protection. Manual and Motorized trolleys - Single and Dual Speed Models. Wrap-Around Side Plates - Act as safety lugs and as bumpers to protect wheels. Available to fit American Standard I-Beams, wide-flange, and patented track beams. Precision Trolley Wheels - Dual tread trolley wheels fit either flat or tapered I-Beams. Also available in bronze or stainless steel. 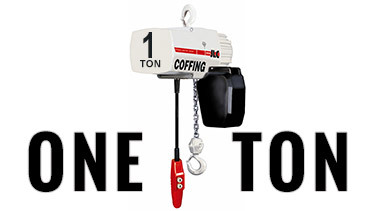 Coffing Hoist Lifetime Warranty: Every Coffing electric chain hoist is thoroughly inspected and tested prior to shipment from the factory. Should any problem develop, return the complete hoist prepaid to your nearest Coffing Hoists Authorized Warranty Repair Station. If inspection reveals that the problem is caused by defective workmanship or material, repairs will be made without charge and the Coffing hoist will be returned, transportation prepaid. The JLC-V Infinitely Variable Speed. The Best Control Available. The Variable Frequency Drive (VFD) allows for unsurpassed load-spotting and inching capability. The VFD offers additional speed flexibility that standard 2-speed motors cannot offer. The soft starting and stopping of the unit is perfect for delicate applications and reduces the daily wear and tear. The compact size of the drive unit allows neat and complete placement under the units cover. JLC-V drives feature a Closed Loop System. The Closed Loop System provides additional load control in lieu of a secondary load brake by monitoring the movement of the load hook through the transmission. The JLC-V option with the renowned Coffing electric hoist design features of a five-pocket load sheave, multiple-disc motor brake and overload clutch and you have the best performance value in the marketplace today. VFD Control Options - The standard 2-step buttons allow the operator to increase and maintain the lifting or lowering speeds. The optional 3-step buttons allow the operator to increase, maintain, or decrease the lifting or lowering speeds without interruption. Closed Loop System - Monitors the load hook's direction and speed; additional components monitor motor amperage to provide consistent and reliable operation. In-field instant programming - from infinitely variable (12:1 speed ratio) to any intermediate, predetermined speed range. 24-VAC control inputs built-in. Ergonomic Partners specializes in the quick shipment of 1 ton and 2 ton electric hoists. 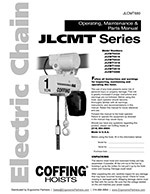 We are a platinum distributor for Coffing electric hoists; serving clients from coast to coast, Canada, Mexico and especially focused in the states of Missouri, Illinois, Indiana, Kansas, Arkansas, Mississippi, Nebraska, Tennessee, Kentucky, Iowa, and Oklahoma.